Respected German publication, KEM Konstruktion, requested editorial information on Electro Kabuki for its Hannover Fair preview edition. The magazine covers equipment and technology used in staging, theatres, cinemas and product launches, so we were only too happy to oblige. 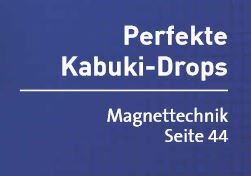 Colleagues at our parent company in Germany – Magnet Schultz Memmingen – are exhibiting Electro Kabuki among the organisation’s electromechanical products and solutions on show at the trade fair. The KEM article gave us a fine opportunity to explain the innovative engineering features in EK while providing some valuable additional awareness in a country known for its dynamic theatrical market and heritage. You can check out the EK editorial coverage in KEM Konstruktion online or in the PDF version of the printed magazine also viewable online. You’ll need to scroll to page 44 for the latter. And you’ll need to be able to read German to understand either! It’s worth pointing out that the Hannover Fair is the world’s leading trade event for industrial technology, and one of the largest too. This year it takes place at the Hannover Messe from 23rd to 27th April. If you’re able to visit the show, be sure to see the Electro Kabuki display on the MSM stand H07 in Hall 15. Enter your email address to sign up to the latest EK news. Flexible enough to send you round the bend! Absolutely no problem if it rains on your parade. Weatherproof Electro Kabuki means absolutely no problem if it rains on your show. on Now you see it, now you don’t! Rigging EK live in a dance show. We'll be happy to assist you with a quotation.